The Chapel Designers...who are we...what are we about. We are about beautiful flowers and designs. Perhaps beyond that we are about camaraderie. We are about supporting each other in the day to day business of creating no matter where we live. We are about sharing ideas. We are about laughing with each other. We are about caring about each other on a level beyond business associates. We are almost 40 strong with a love of beautiful things created from nature. 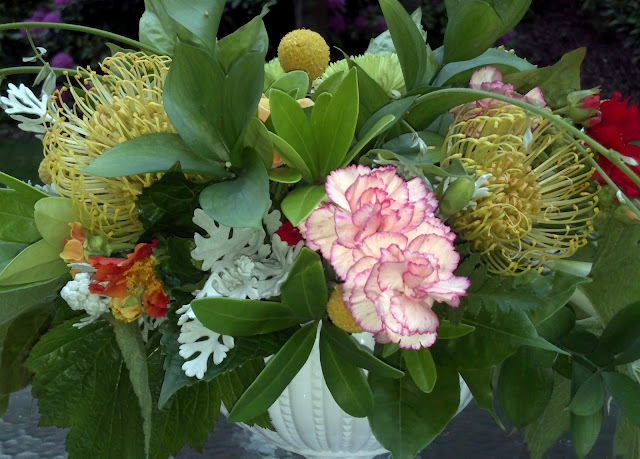 On our recent trip to gather in New York City, many of our group had the opportunity to take a course at Flower School New York; The Art of the Compote with Areiella Chezar as the instructor. Ahh...the compote...such a simple vessel. Carol and I were instantly drawn to the pieces we saw emerge from this class. Our group suddenly became compote crazy, at least those who weren't already in that category. Across the country there was a search on for "compotes"...where, what color, can you paint them, what materials. We have had a great time watching the designs emerge from this group of Chapel Designers. Isha Foss, one of our group, came up with the idea of a Blog Blitz...for lack of a better title. What if each of us created a compote and then posted it on our blog? What if we each then provided a link to all the other blogs in our blog posting? Well, you can imagine people jumped at the idea. An idea is born and embraced. We had a great time designing in our compotes and are happy to share the results. As much as we love our compotes...what we really LOVE is being a part of the Chapel Designers! Here are our compote designs! We certainly hope that our west coast brides come to embrace this style. We would love to see them featured in some of their weddings! And now for the Blog Blitz, as promised! Click on the following links to see some of the other Chapel Designer's compote designs! Be sure to check back, as more links will be added as they become available! We love our Chapel Designers! Gorgeous! 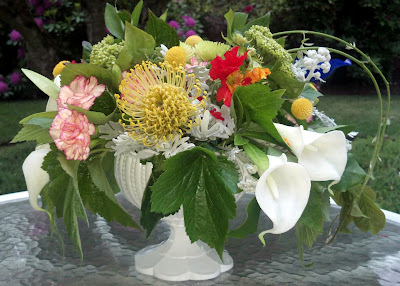 I hope I see more of these lovely compote arrangements on your blog this year! Love these compotes! I sure can learn a thing or two from you. How do you visualize these?